She came at just the right time. It had been 7 months since I realized I had no cartilage in my right hip socket… No wonder lotus, and leg behind the head had been hurting….. With that one x-ray I had entered into what I could only then see as an era that was furnished with an elevator that was going down. In one fell swoop, my practice, my beautiful practice, along with my concept of self as a fathomless source of strength and balance was doing mostly supported legs up the wall and headstand for an entire month. In what can only be described as desperation mixed with an inkling of shame, I signed up for 20 private Pilates lessons hoping to recalibrate some of my movement/thinking patterns that had been a part of wearing my hip cup dry. A few months of informed Pilates instruction, legs up the wall and lots of long headstands, because most every other pose hurt, I was starting to see a state of equilibrium that was perhaps interesting. 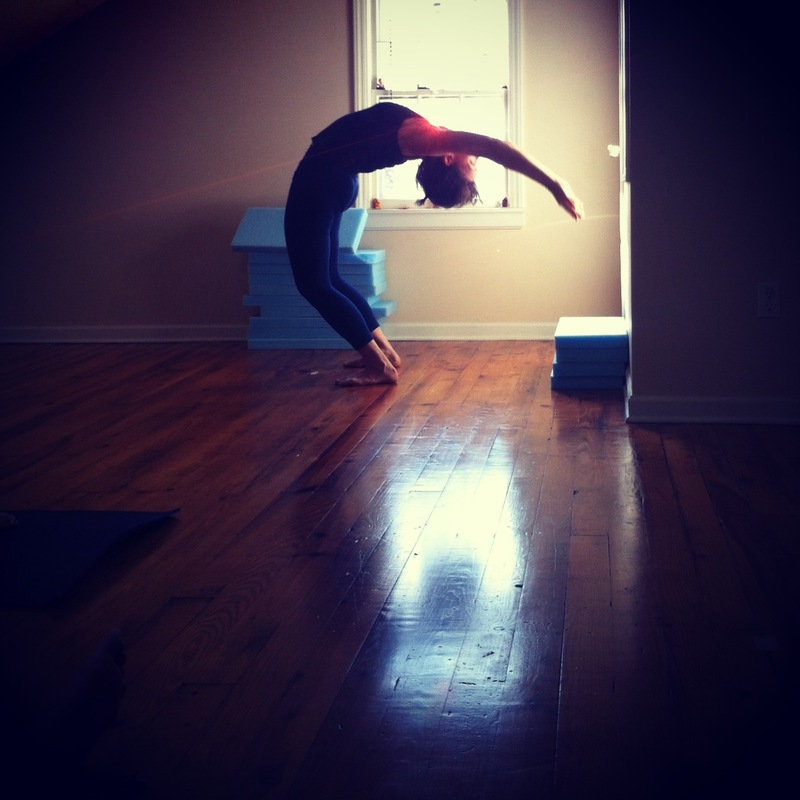 I began to re-investigate a few asana, only now it is way more personal. Then this email came to my in box. I have a 3x/week home practice of the Primary series, severely pruned and deeply cherished, and need to check in with a teacher. I learned as much of the Primary series as I could 10 years ago through classes, videos, and a couple of private lessons. I’m now 72. Ashtanga classes and teachers keep disappearing; my annual Ashtanga tune up is two years overdue. My first goal is Do No Harm to my body. My second goal is Never Stop Practicing. May I schedule a private lesson with you? When, why and how to use which head & eye position with what posture. There is no set head position and there is no set dhristi. the yogi must investigate the head, neck, eye relationship that will best assist the back in expressing itself. The arms and legs have the same job. Arms and legs are a kind of sense organ, a kind of kinesthetic movement sense that serves the Self. They, the arms and legs, have the task of continually investigate the best way to assist the torso, assist the central axis to remain central. For every pose there are countless variations of arm/leg configurations. Forget eyes look up in this pose, arm goes here or there or any set place because that is what the pose is. The pose is an investigation of head, neck, back ,eye, arms, legs, and ALL other body/mind complex relationship to itself. The poses are just talking points, or rather thinking points…The poses are serving suggestions…. THINK! Are my arms and legs assisting the flow of energy in my spine? What happens when I lift my head up? What if my eyes follow that direction? what if a glance internally? What if I can look internally AND externally. What if my arms and my legs are in communication with each other for the greater good of the whole body? Continue to think… What thoughts, images, pondering will assist my whole self to summon the integration of this whole self. This 72 year old yogi nudged my 58 year old self to see my 70 year old self by sharing with me that her 70th birthday gift to herself was a headstand with no wall. There it was. The up elevator. It was fantastic to fly like I could when I was myself of then, I can see that I can fly like my self of now, and it is fantastic. I can live in concert with my future self’s ability to do her personal and universal fantastic flying. This private lesson was filled with debunking dogmatic myths about what, when, why and how ashtanga is. In sharing my decades of ashtanga experience with this person I realized that all of this knowledge is my best remedy. To thine own self be encouraging and supportive and interested and caring and willing to share your knowledge..